Grand Canyon National Park celebrates its centennial anniversary this month. Every day is a good day to celebrate the majesty of the Grand Canyon. However, it becomes even more special when the national treasure is marking its 100th anniversary. On February 26, 1919, President Woodrow Wilson signed an act that established Grand Canyon National Park – three years after the creation of the National Park Service – and permanently protected and preserved the geological wonder for future generations. To commemorate its centennial, Grand Canyon National Park has plans to hold a Founders Day celebration from 9 a.m. until 9 p.m. on Tuesday, February 26. During the free event, guests can sign a birthday card, share their favorite Grand Canyon memories at an oral history booth and have cake. Special evening program speakers will talk about the relationship between the Grand Canyon and the park’s 11 traditionally associated Native American tribes. Other events to celebrate the centennial will be held throughout the year. Covering more than 1.2 million acres, Grand Canyon National Park is dominated by the spectacular Grand Canyon. With distinct combinations of geologic color and erosional forms, the Grand Canyon is 277 miles long, up to 18 miles wide and a mile deep. The twisting gorge was formed during some 6 million years of geological activity and erosion by the Colorado River, which stretches 1,450 miles from its source in the Rocky Mountains to the Gulf of California. Ongoing erosion by the seasonal and permanent rivers produce impressive waterfalls and rapids of washed-down boulders along the length of the canyon and its tributaries as well. The river bisects the park into the South and North rims, where visitors can view the mountainous buttes, spires, mesas and temples of the canyon. As the second-most visited national park in the country, Grand Canyon welcomes more than 6 million domestic and international guests annually. The South Rim is open year-round, and the North Rim is open from mid-May until mid-October. Each year many tourists get their first panoramic view of the Grand Canyon – considered one of the Seven Natural Wonders of the World – from the lookout at Mather Point, which has an elevation of 7,120 feet. Shoshone Point, accessible by an unimproved dirt road, offers more never-ending vistas as well as accommodations for special events. A trip to Grand Canyon would be incomplete without a hike, and the natural wonder includes easy, moderate and strenuous trails. Their distances range from 1 mile to 30.5 miles. Considered the park’s premier hiking trail, the Bright Angel Trail covers 9.5 miles from the South Rim down to the Colorado River. It approximates a route used for millennia by the Native American tribes that have called Grand Canyon home. Access to two campsites allows hikers and backpackers to sleep on the trail overnight. For experienced hikers, the 8.9-mile Hermit Trail, where the trailhead is accessible by shuttle bus, offers a challenging route to the Colorado River. The upper section drops almost 2,000 vertical feet in the first 2.5 miles. 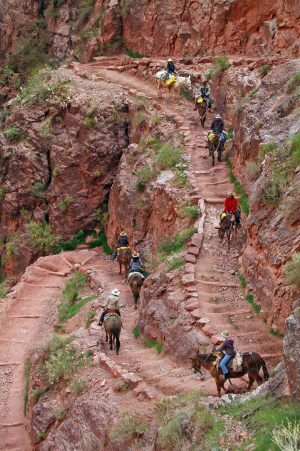 There are other ways to explore Grand Canyon than by foot, however. 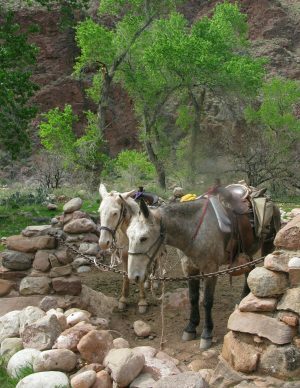 Guided tours include bicycle, bus, van and Jeep tours of the South Rim; mule trips and guided hikes of the North and South rims; and helicopter and airplane tours. Visitors also can take a three- to 21-day whitewater rafting excursion through Grand Canyon on the Colorado River, which has rapids ranging from class I to class V. Half- and full-day smooth-water rafting trips on calm waters in the northeastern section of the canyon are available as well. Sitting 8,000 to 9,000 feet above sea level, the North Rim offers summer visitors a completely different experience from the South Rim. A desert oasis with lush green meadows surrounded by a mixed conifer forest sprinkled with white-barked aspen, the North Rim is more rugged and less touristy than the South Rim. Visitors might spot deer, coyotes, turkeys or mountain lions. Desert bighorn sheep, the largest hoofed mammals in the park, roam the entire depth of the canyon. Relatively scarce along the rim, they prefer the rocky slopes and sides of the inner canyon and are likely to be found near reliable sources of water. Mule deer, easily identifiable by their large ears, are among the most prevalent mammals on the South Rim. Elk are seen frequently around Grand Canyon Village on the South Rim. Natural splendor is not the only experience Grand Canyon has to offer, however. Park rangers share their knowledge about its nature, science, history and culture in free programs for tourists. Manmade structures offer a glimpse into Grand Canyon’s past as well. Grand Canyon Village – the most popular entryway into the park – offers lodging options, historical sights and spectacular views. The Grand Canyon Railway Depot, which brings Grand Canyon Railway passengers to the park, offers a trip back in time on restored rail cars with musicians and cowboy characters. Out the windows, the terrain changes from high desert to prairie to pine. El Tovar Hotel, located on the South Rim, opened in 1905 and was renovated in 2005. Luminaries such as Theodore Roosevelt, who is credited with preserving Grand Canyon as a game reserve and a national monument, Albert Einstein and Western author Zane Grey have stayed at the grand hotel, which is a Registered National Historic Landmark. Lodging should be booked well in advance, but availability is more likely in the winter. Directly across from El Tovar, the Hopi House is built like a Hopi pueblo. The sandstone walls are reddish in color, and tiny windows let in only a small amount of light. Most of the rooms have the typical Hopi-style ceiling of saplings, grasses and twigs with a mud coating on top, resting on peeled log beams. Corner fireplaces, small niches in the walls and a mud-plaster wall finish also are defining features. Kolb Studio, the historic home of pioneer photographer Emery Kolb, is in the South Rim’s Historic District. 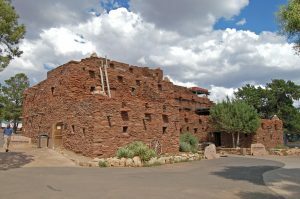 Tusayan Museum, along Desert View Drive, offers a glimpse into Grand Canyon life of the Pueblo Indians some 800 years ago. Exhibits include pottery, arrowheads and household artifacts. At Desert View Point visitors can climb to the top of the 70-foot tall Watchtower, a replica of prehistoric towers found on the Colorado Plateau, for a panoramic view that extends more than 100 miles on a clear day.Featuring a long history of human occupation, the Phantom Ranch area offers a last vestige of riparian habitat in Arizona. In some ways it has remained remarkably unchanged – still remote and still accessible only by foot, mule or river. Whatever you decide to do in this natural wonder, however, be sure to bring a camera. For more information, visit nps.gov/grca. Published on January 31, 2019 in Beyond the Peach State, Travel.